If you are looking for a sleek design, an excellent viewing experience, and smart LED TV features all coupled under one roof then the Samsung 55MU8500 is a great choice for you. 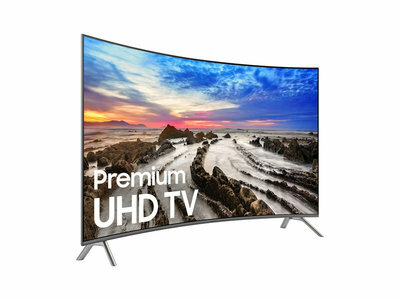 This curved LED TV from Samsung features intelligent functions coupled with advanced features from Samsung such as Peak Illuminator and Smart View to improve the overall image quality and accessibility of the LED TV. The HDR1000/Extreme and Crystal Clear display ensure that you enjoy a real-like viewing experience for all your favorite TV shows, movies, and games. The LED TV also sports a Clean Cable design that reduces the clutter of wires for a clean and simple setup. Overall, we can say that the beautifully curved 55MU8500 Samsung LED TV is one of the best LED TVs out there available today.